In a matter of two years, Skylanders made a sizable dent in the video game industry, racking up over £300 million in sales. 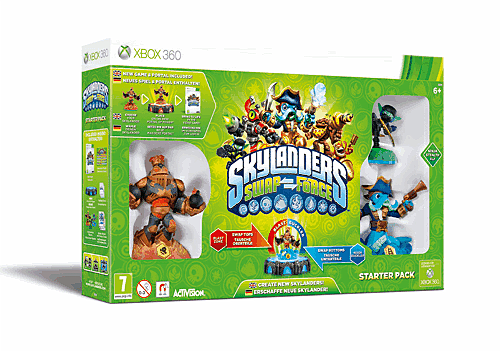 That said, the franchise returns for a third time with Skylanders: SWAP Force, which retains the quality of its predecessors. That doesn't mean it has nothing new to offer. In fact, the third has so much content, it'll take weeks and months to uncover it all. As with previous entries in the series, the game works with a magical portal that plugs into your game system and interacts with any character figurines you place onto it. The Starter Pack automatically comes with one, along with three playable characters - the interchangeable Blast Zone and Wash Buckler, as well as Ninja Stealth Elf. Like before, additional characters are available for purchase, and are necessary for getting through key areas of the game, depending on their element. For instance, Wash Buckler is an octopus pirate creature, so he sits firmly in the water category, while Blast Zone throws bombs and lets loose with flaming breath, earning him a spot in the fire class. 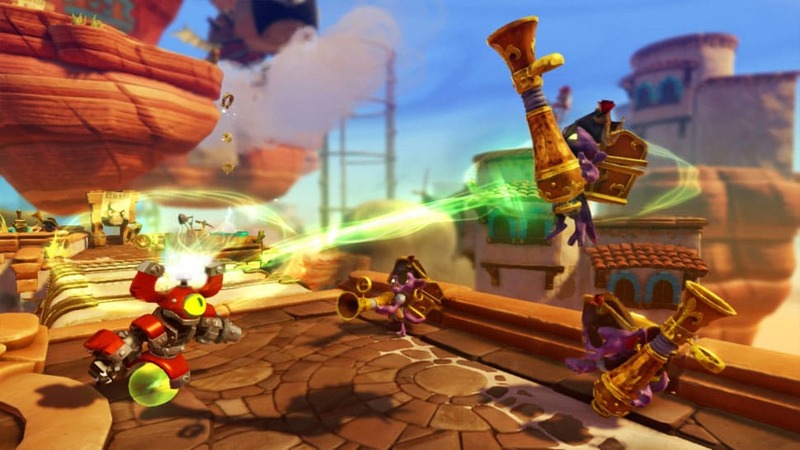 The story revolves around the Skylanders, as they once again battle the diabolical Kaos. This time, he seeks four kindred spirits that can grant him unimaginable power. The Skylanders must work with the citizens of Cloudbreak Islands - as well as a few familiar characters, like pilot Captain Flynn - to stop Kaos' plan and restore peace to the land. There are several key features that allow SWAP Force to stand apart from its prequels. The first is right there in the title - the ability to swap characters. Select heroes have their top and bottom halves exchanged to create new effects and battle techniques. For example, you can immediately switch two of the three included figurines around and have Blast Buckler and Wash Zone do your dirty work. In some cases, swapping is even encouraged, as there are certain zones that won't open unless you have both halves properly filled in, like water and fire joined together. Another new feature - which fans have begged for - is the ability to jump. Yes, you can finally go vertical in SWAP Force, and in some cases, the game benefits from it. The levels are much larger and allow you to climb up or leap below to find treasure and other items, including Soul Gems and Story Scrolls. The more you collect, the more abilities you'll eventually unlock. Furthermore, your Skylander comes with a couple of great abilities, including projectile and melee attacks. As the game progresses, you can also visit pods and unlock new techniques intertwined between top and bottom halves. With Wash Buckler, for instance, you can either unleash his fury with a bubble gun, which incapacitates enemies for a short time, or let him kick back with tentacle strikes. The choice is yours, and with all the money you collect, you should have no problem powering up. In addition, various hats and accessories are available, which not only make characters unique, but also give them strengths in key areas, such as better armour, speed or power. It pays to experiment and see what's around the village's shop when you get a chance. And finally, the Arena Mode returns, allowing two players to fight against one another in several inspired locations. 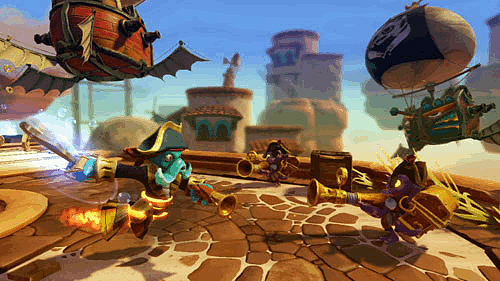 While this mode is short on features, it's fun to square off against a rival Skylander. Skylanders: SWAP Force may not have the most original soundtrack, but it's pleasant to listen to, and recreates a familiar fantasy element that worked so well in the first two games. It's also great to have actor Patrick Warburton back as Flynn, using his smarminess to try and wow the citizens. If there is one downfall with SWAP Force, it's the high cost of getting everything in the game. True, you don't have to worry about paying for items like hats and new abilities, but you do have to purchase new Skylanders characters. With 55 available the price quickly skyrockets. Fortunately, you can get through most of what the game has to offer with the starter pack - even if you can't access certain areas. Although there's plenty of figure-swapping competition with other games on the market, like Pokémon Rumble U and Disney Infinity, Skylanders: SWAP Force is the king of action/adventure games. The new characters are a blast to play with, the new gameplay items add to the experience and the hidden zones will keep you coming back for more, even if you have to pay a little extra. Great single-player quest loaded with hidden goodies. New gameplay elements keep things interesting. Extra characters come at a price. Fixed camera can be a pain. Arena Mode remains mostly unchanged.